Hi there! Kristine here with a fun shaker card that I made with The Rubber Cafe November Creative Cafe Kit of the Month. In addition to the supplies from the kit I used, Spellbinders dies, Red Tinsel Embossing Powder, Scrap Happy Glue, Copic Markers and Double Sided Foam Tape. To make this card, start by cutting out your paper. The card base is made from a 8 1/2" x 5 1/2" piece of red cardstock. 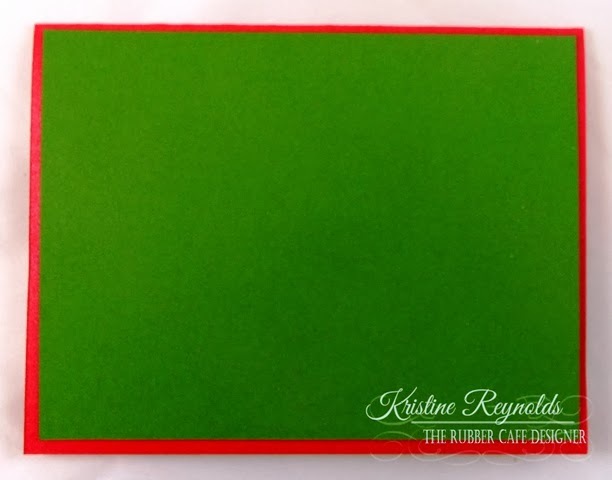 The green panel is 4" x 5 1/4"
You'll need to cut two pieces of white cardstock. 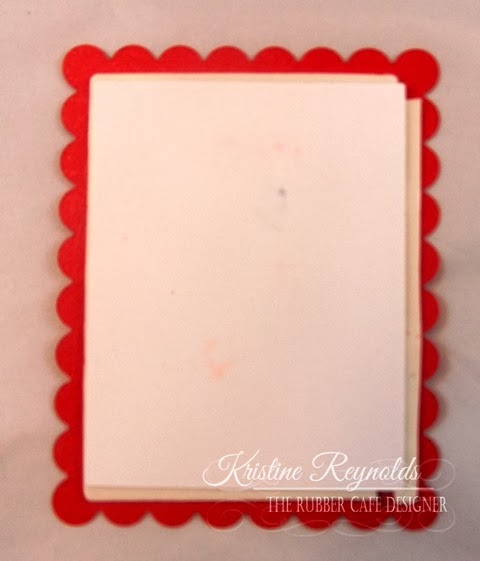 1- 5 1/8" x 3 7/8" and 1-5 1/8" x 2"
Fold the red cardstock in half to create a top folding card measuring 4 1/4" high x 5 1/2" wide. 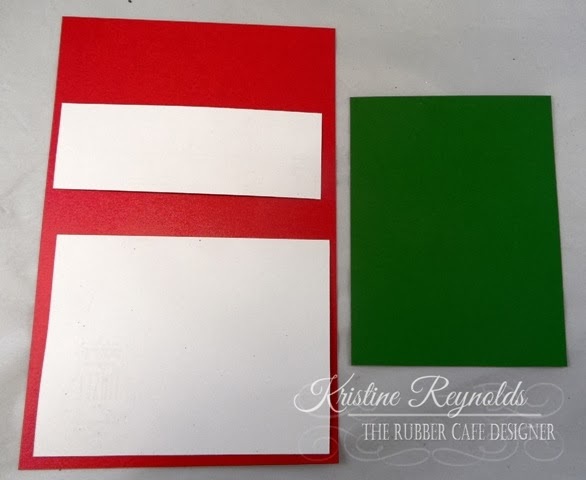 Adhere the green panel to the card front with Scrap Happy Glue. Versa Mark Stamp pad, and heat emboss with Red Tinsel embossing powder. 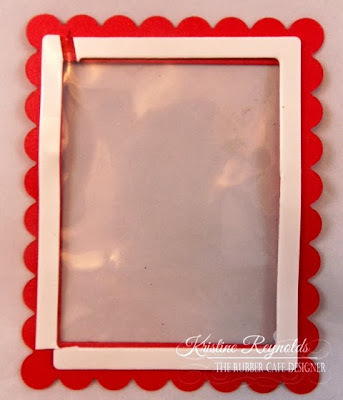 Adhere the smaller panel to the top of the larger panel and tie red ribbon around the panel. Adhere the panel the the card front. To create the shaker portion of the card die cut a white panel of cardstock with a rectangle Spellbinders die. 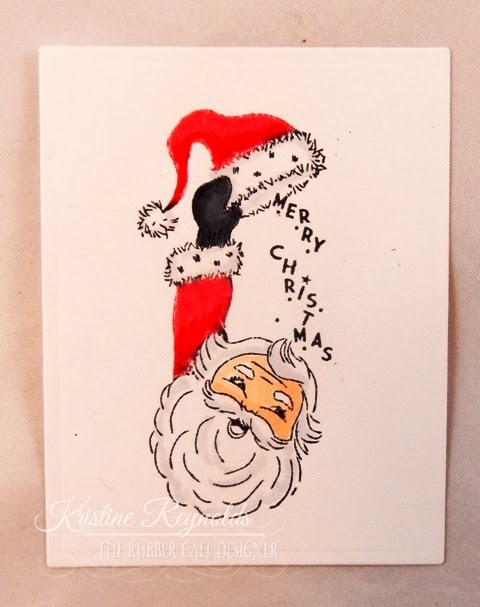 Ink up the Santa image with red and black ink and stamp. Color with markers. I used C5 and C3 on his mitten and C1 on his beard. His skin was colored with E00 and E01 and his tongue was colored with R22. 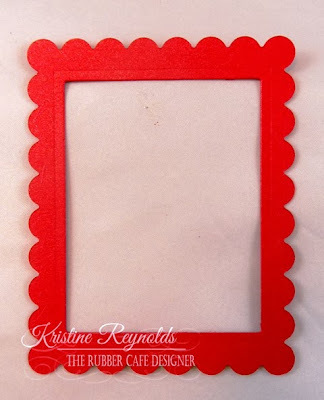 Die cut a red scallop edge Rectangle panel with a Spellbinders die. 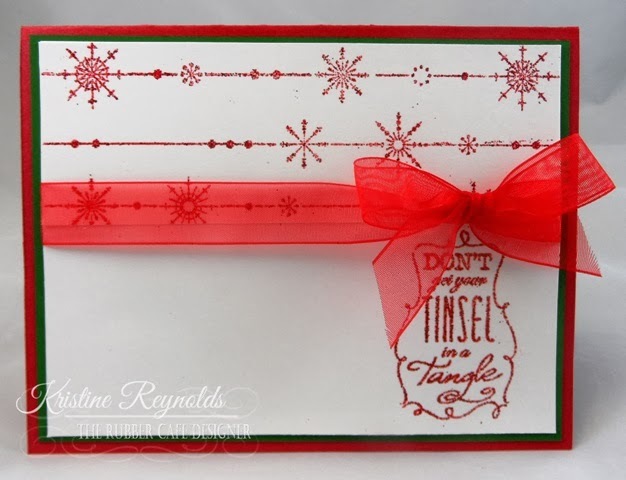 Then use a rectangle die one size smaller than the one you used for the santa panel and die cut out the center so it looks like the picture below. 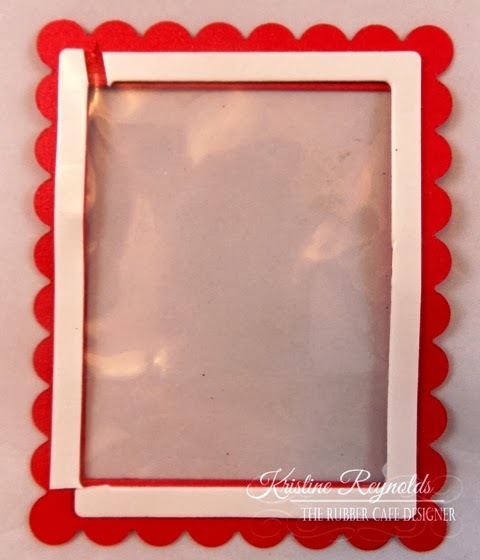 I cut the bag apart that the sequins came in and adhered one layer of it to the frame. Then I adhere double sided foam tape around the edge. 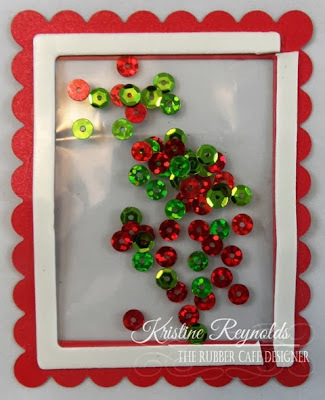 Pour sequins into the frame. 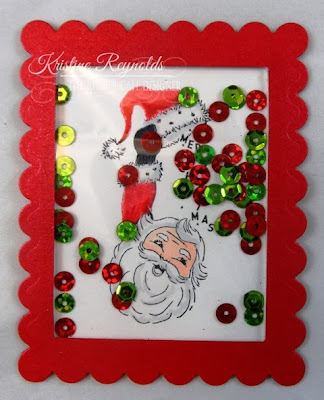 Take the paper off the back of the foam and lay the santa image panel upside down on the foam. When you flip it over it will look like this. 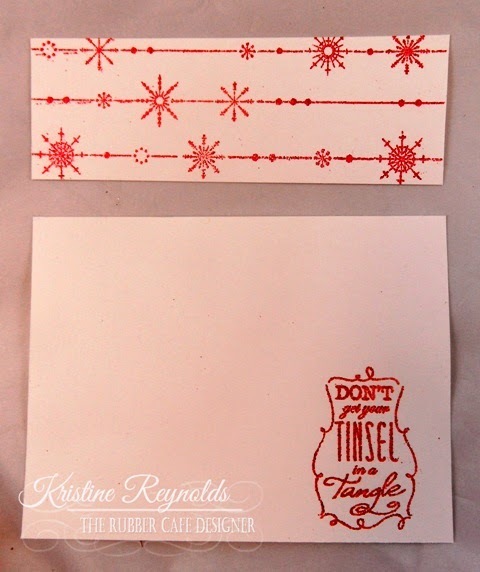 The final step is to adhere it to the card. Use Scrap Happy Glue to adhere sequins and snowflake rhinestones to the card as shown. 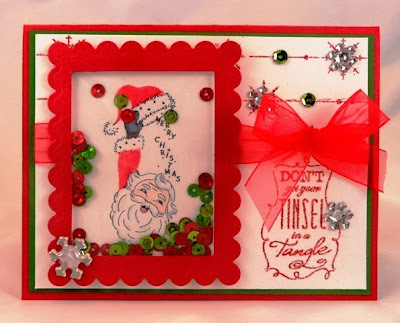 I hope you enjoyed my Shake Card Tutorial! Check back soon for more great projects from the Design Team! Thank you for the shaker card , how cute . 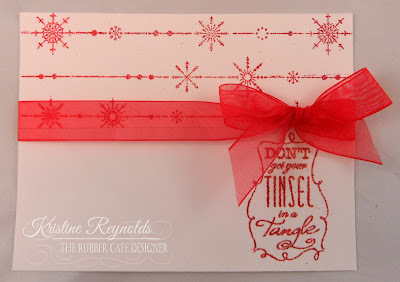 Great card- I lover shaker cards! Too cute, the sequins are a fabulous touch!